Parry Law raised an amazing £2007 for their charity of the year 2017. The highlight of the fundraising was a charity dusk safari and dinner at Port Lympne. From May 2017, the way fees are charged for probate applications will change. The current flat fees (£155 if the application is made by a solicitor, or £215 if made by an individual) are to be replaced with a banded fee structure. This means that small estates (of less than £50,000) will be able to proceed without any application charge being payable, but the probate application fee will otherwise be dependent on the size of the estate. It is expected that for estates with a value between £50,000 and £300,000 the probate fee will be £300, estates up to £500,000 will pay £1,000, and those up to £1,000,000 will pay £4,000. This will be a significant change from the previous structure for some applicants, but a solicitor can help guide you through the process. If you would like to discuss the changes or any other probate related matter, please get in touch with our private client department. 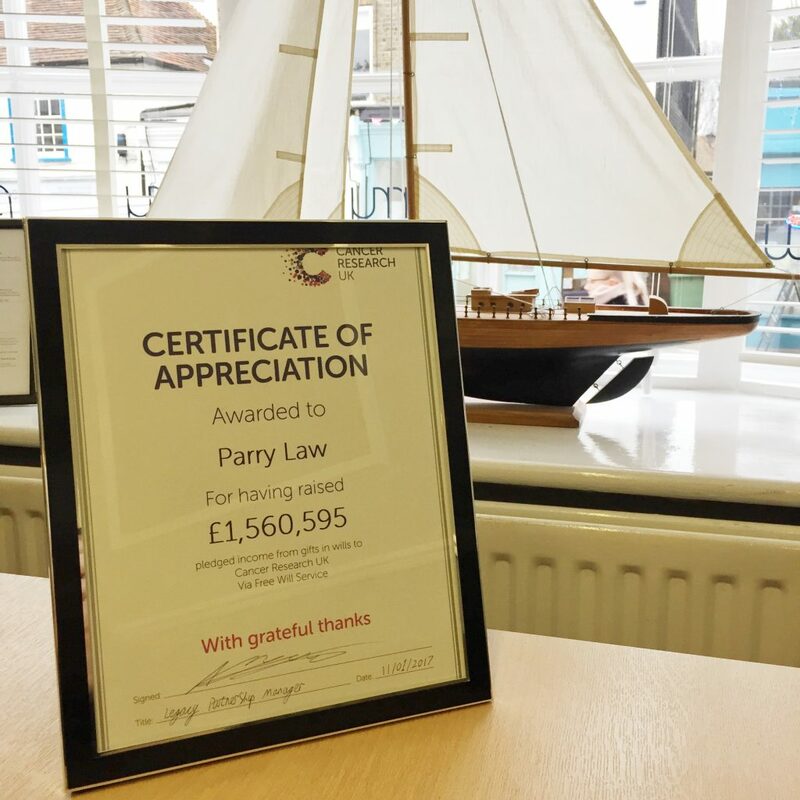 Parry Law have been presented with a certificate from Cancer Research UK after raising £1,560,595 in pledged income from gifts in Wills to Cancer Research UK via the Free Will Service. Contact our Wills and Probate department if you would like further information or would like to discuss making your own Will. 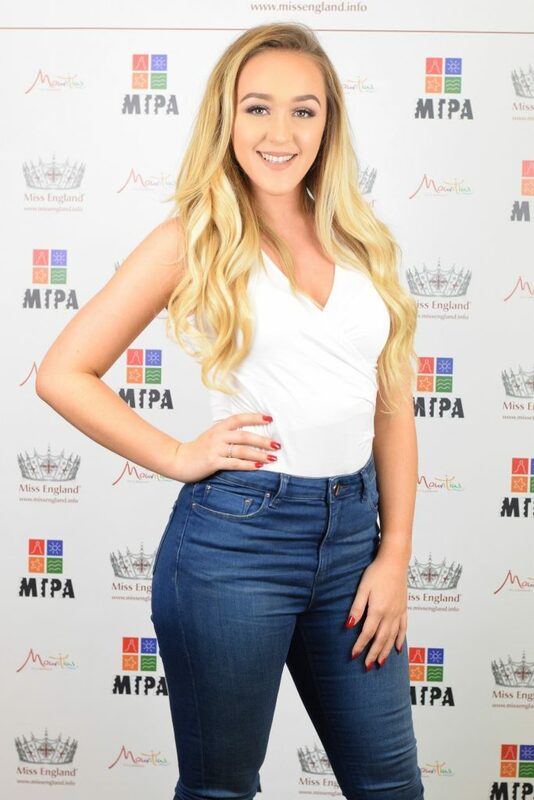 We are delighted that Nicole Toone, 23 years old, an Archivist and Admin Assistant at Parry Law is currently one of 14 contestants competing in the third Miss England semi-final heat for 2017. Nicole needs the support of her local community before voting lines close in order to secure a place in the Miss England semi-final held in June 2017. Nicole now has a month to promote herself in the local area to gain votes from the public. During this time, she will also be raising awareness and funds for the Miss World Charity ‘Beauty with a Purpose’. Nicole needs your support to help win the Miss England Semi Final heat title. You can vote for Nicole by texting MISS SEMI10 to 63333. 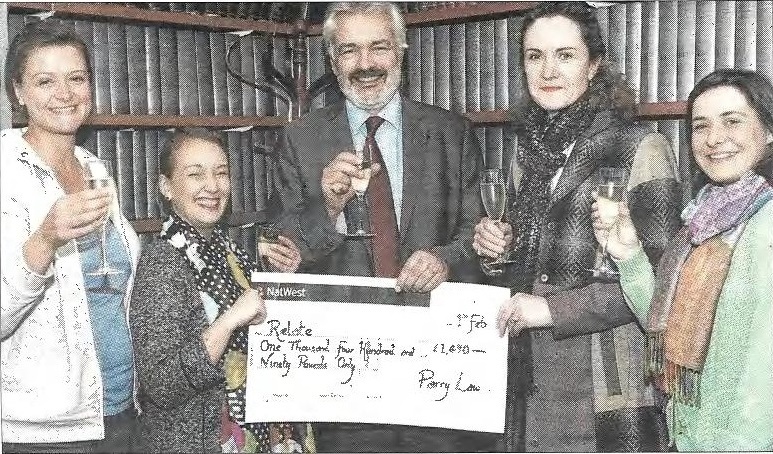 Parry Law are delighted to be supporting the Strode Park Foundation as their chosen charity. 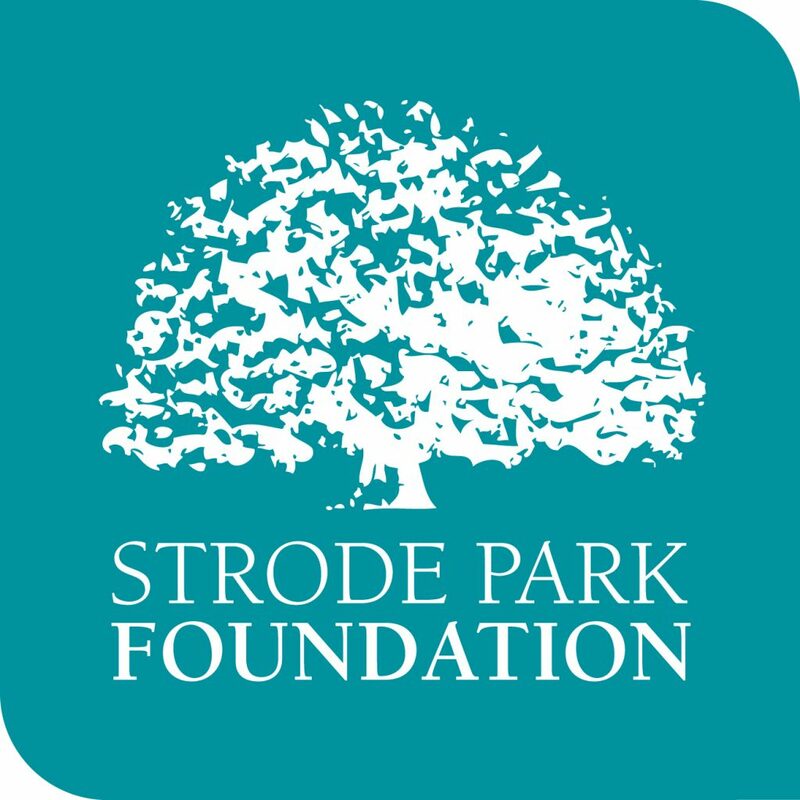 Established 1946 the Strode Park Foundation is a Kent charity providing vital care and support services for children and adults with disabilities. The Foundation aims to meet all levels of need, from those requiring a small amount of home care and support to people with more complex disabilities requiring neuro-rehabilitation or 24 hour nursing residential care. Strode Park promotes independence well-being and choice throughout its care services and enables people to live life the way they choose. We look forward to this special partnership in this particularly special year for Strode Park as they celebrate their 70th Anniversary. A charity has been presented with £1,500 after a year-long community project led by Parry Law. Donations flooded in from businesses and fundraising included a raffle, auction and evening meal at The Abode in Canterbury. The cash will help Relate East Kent – our chosen charity of the year which offers counselling services. Carolyn Parry said “We can’t believe the generosity of the people of Whitstable, Herne Bay and surrounding areas”. “We kept the fundraising going through the year, even with small events such as a cake bake at our office and face painting at the Whitstable Regatta. All our staff have been outstanding and we all have a lot of fun doing this”. We are delighted to announce that Perveez Sethna, our Head of Family has qualified as a Collaborative Lawyer. As an alternative to the Court based process, we are now able to offer our clients an alternative route to resolving all issues, including those relating to finances and children. 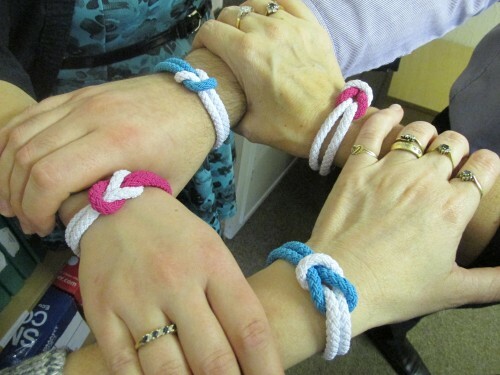 Unlike the traditional process whereby when couples split they each take independent advice from their own family lawyer, the collaborative route consists of a series of round table meetings whereby you and your former partner, each with your own solicitors all sit down with an agreed commitment to resolve issues together. Rather than dealing through solicitors this process allows you to work with them to reach the best solution for you and your family. Under this process it is not necessary for either of the parties to attend Court. At its simplest, the collaborative process is all about reaching solutions together, to ease the pain of family breakdown.